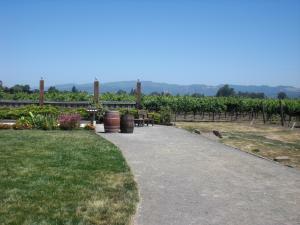 The wine recommendations for July 2009 focus on two varieties produced in California. In types of white wine, we look at Chardonnay; in types of red wine, we explore Zinfandel. These particular varieties are great for summer parties. Chardonnay is superb with salmon and other substantial fish, and zinfandel is perfect for barbecues. Chardonnay is the star that keeps on shining. People love it, and the love affair is not deeming anytime soon. Zinfandel, I believe, is poised to take its place among the starts of the wine world. It gains popularity year after year for its versatility and wonderful taste. If you are not a fan yet, give it a try, you will enjoy it immensely. Beaulieu Vineyard Chardonnay Napa Valley Carneros 2007. This is a wonderful wine with notes of nectarine, pear, and spices. Rich and complex. Score of 90, $17.00. California. Sebastiani Chardonnay Sonoma County 2007. Full-bodied with floral aromas. Notes of melon and honeysuckle. Score of 88, $13.00. California. Healdsburg Ranches Chardonnay Sonoma County Unoaked 2007. Crisp and fresh, with notes of pineapple and apple. Score of 88, $14.00. California. Moon Mountain Chardonnay Sonoma County 2007. A freshness that is perfect for summer. With mineral notes and touches of citrus and apples. Score of 87, $14.00. California. Saucelito Canyon Zinfandel San Luis Obispo County Backroads 2007. Lovely wine with notes of berry, spices, and cherry. Score of 89, $18.00. California. Klinker Brick Zinfandel Lodi Old Vine 2006. Notes of berries and cherry; spicy and slightly sweet. Score of 87, $17.00. California. Novy Zinfandel Russian River Valley 2007. Notes of cherry and berries; spicy, a bit of tannin, and rich. Score of 89, $19.00. California. Rosenblum Zinfandel Paso Robles Appellation Series 2006. Notes of cherry and berries; suggesting pepper and licorice. Score of 88, $18.00. California. Wine Recommendations for July 2009, Love These Chardonnays and Zinfandels!